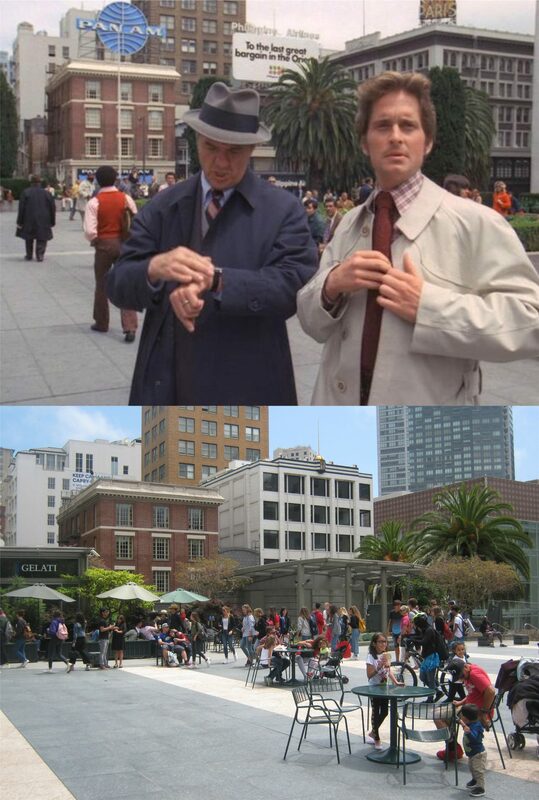 It has to be the quintessential San Francisco film locations movie and it’s been covered by a lot more devoted and accurate film location experts than myself, but last Sunday I felt like doing some more location touring of Alfred Hitchcock’s 1958 classic ‘Vertigo’ after watching it recently on Turner Classic Movies. The film commentator labeled it the best movie ever made. I could take point with that, but it’s still a lot of fun to watch. So put on your stalkings and we’ll follow along with Jimmy Stewart as he trails Kim Novak through Downtown San Francisco. We’ll start where John “Scottie” Ferguson (James Stewart) begins to stalk Madeleine Elster (Kim Novak) to try to find what makes her tick. Scottie watches her on Mason Street as she leaves her hotel. Behind him is the Pacific Union Club and in the far background the north tower of Grace Cathedral. Work that began in 1928 on the church had stopped when this movie scene was shot and the south tower was not finished. In 1960 work resumed on the church and the south tower is visible in my picture. Madeleine leaves the Brocklebank Apartments in her green Rolls Royce. Scottie watches her as she drives past him toward the Mark Hopkins Hotel. The Fairmont Hotel is on the left. Madeleine turns left onto California Street. There apparently was road or cable car line work being done at this intersection at the time. Scottie follows her down Bush Street toward Grant Ave. this is just a little down from where the roof of the Stockton Tunnel is and just east of Burritt Alley where Miles Archer was bumped off by Brigid O’Shaughnessy in the Maltese Falcon. They turned right onto Grant Ave. and pass Sutter Street toward Post. The White House Department Store sign can be seen on the left in the movie image. Hitchcock gets a little tricky here as Madeleine turns left into what will turn into an alley in the next scene but is only a small driveway in reality. This was where Kim, I mean, Madeleine turned in, but the next scene puts us in Claude Lane several blocks north from here. Madeline enters the back of an old brick building in Claude Lane followed by Scottie. I used the two arched entrances of the white building seen in the film on the right with the Margaret O’Leary sign today to determine where they entered across the alley from it. Now, here’s where it got to be more fun; to try to find evidence of the exact spot Madeline left the alley into a flower shop followed by Scottie. You can see three arched openings on the brick building in the movie. The one on the left is the doorway where Madeleine and Scottie entered into the flower shop which was filmed in a different location. The three openings have been bricked over but the doorway they went through is visible on the far left next to the blue divider. The second brick doorway was behind the where the orange chairs are, the smaller window on the far right in the film image was behind where the first painted blue flower is. Although, it was fun to visit this spot, I imagine hundreds of other people got here long before I did! Scottie leaves Claude Lane bewitched, bothered, and bewildered. Oh, wait, that was from another Kim Novak movie set in San Francisco! Long queues for the Powell and Market Street cable cars weren’t a reality yet in the 70’s. “sfinfilm.com, the blog that dares to use the Vaillancourt Fountain for a setting.” This fountain hasn’t gotten any more attractive since the 1970’s, especially now that the water has been turned off due to the long California drought. California and Powell Streets is the only spot where the California and Powell-Hyde-Bay cable car lines cross paths. The cone shaped structure on the corner signals stop and go for the cars when they reach the intersection at the same time. . There used to be a Wax museum in Chinatown. This would later be a McDonald’s in the 1990’s. Post and Stockton Streets at Union Square: We need more crosswalk cops today! A close up look down California Street from Nob Hill in the 70’s and today: This is one of the most photographed views in San Francisco.